in their presence since the prehistory, buttons have been recovered in the archaeological diggings in Hindu valley (approximately 2800-2600 b.C.) and in the age of bronze in China (approximately 2000-1500 b.C.). They were used in ancient Rome, even if closings of dresses and cloaks, were obtained mainly with laces, buckles and pins. Often pins externally assumed the form that has anticipated the modern idea of the button, likeness also found in the Greek kiton worn by the women and in the coupling big pins present in the Byzantine sagum. They were widely diffused in Europe during the Middle Ages: the first literary mention goes back to the XII century in the poem La Chanson de Roland, where they figure like worthless small things. In the following century, instead, they became a valuable decorative element of cloaks and dresses of the monarchs and of the men of power, demanding for preparation the presence of the goldsmiths. It was necessary to attend till the half of the XVI century for a capillary use of the button, but only with an ornamental function cause lacking of buttonholes. Among the materials of the age, is numbered nacre and very rarely gold and silver. The golden age for the button, when it also assumed the typical functionality, was the second half of the XVIII century, thanks to the extended employment of valuable materials, gold and silver, next to brass. The livery buttons, rather large, often brought the coat of arms of birth. With the decline of Napoleonic empire, slowly disappeared the artistic button in order to leave the place to the manufacturer one. The buttons evolution followed the one of the fashion, from functionally object became decoration accessory, more and more complex and precious. 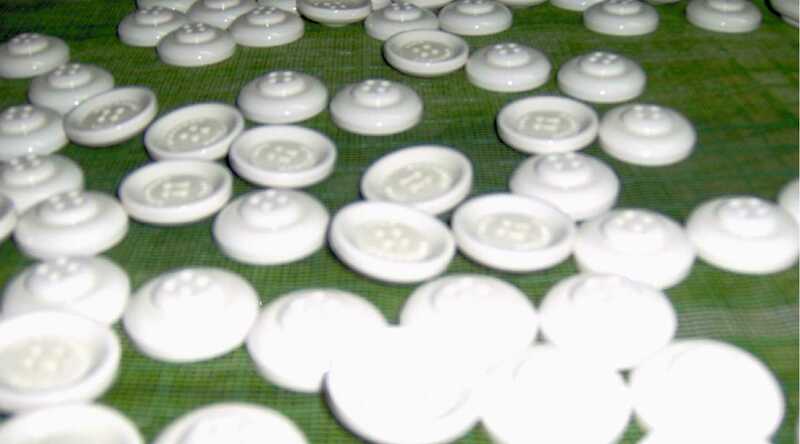 our Company, protagonist of the button modern evolution, is present in the fashion industry with the production of handmade artistic, high-quality buttons and classics.